MEXICO, Jan. 19 (Xinhua) -- Hundreds of mostly Honduran migrants entered southern Mexico on Friday, joining around 1,000 other people from Central America who crossed a day earlier and put Mexico's vows to guarantee the safe and orderly flow of people to the test. The cohort crossed the Guatemalan border into Chiapas state before dawn without needing the wrist bands that Mexican officials on Thursday gave migrants to wear until they could register with authorities, several migrants and an official told Reuters. "The road today was open," said Marco Antonio Cortez, 37, a baker from Honduras traveling with his wife and children, ages two and nine. "They didn't give us bracelets or anything. They just let us pass through Mexico migration." A migration official at the entry point, who asked not to be named because she was not authorized to speak to media, said that at least 1,000 people crossed from Guatemala into Mexico before dawn, without putting on wrist bands. Asked why migrants did not receive wrist bands, David Leon, director of civil protection, said authorities faced a caravan of hundreds of people early in the morning and let them pass rather than risk a confrontation. 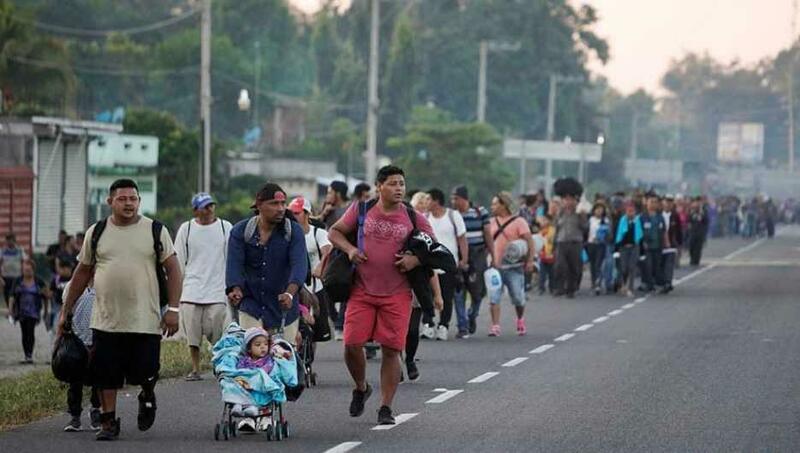 The migrant group proceeded on foot alongside cars on a highway, accompanied by federal police officers, arriving at a shelter in the city of Tapachula around midday. Sitting by the side of the road rubbing cream onto his children's feet, 40-year-old Honduran migrant Santos Pineda said he and his family entered Mexico easily, and without having to provide documents or wear any wrist bands. The family planned to press on to the United States, he said. A migration official, who spoke on condition of anonymity, said those who entered without wrist bands ran the risk of being detained for crossing illegally. Around 300 mostly Honduran migrants with wrist bands were still waiting to cross into Mexico on Friday afternoon. 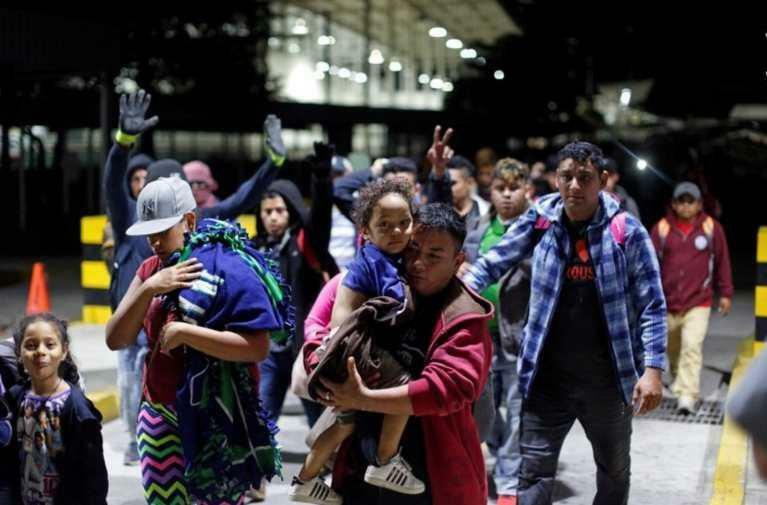 Mexico's migration institute said the migrants can stay in temporary shelters in Mexico until they receive humanitarian visas allowing them to remain in the country, or they can wait in Guatemala for their document to be ready. Groups of migrants left El Salvador and Honduras earlier in the week, the latest in a string of caravans of people largely fleeing poverty and violence. The caravans have inflamed the debate over U.S. immigration policy, with President Donald Trump using the migrants to try to secure backing for his plan to build a wall on the U.S.-Mexican border. Mexican President Andres Manuel Lopez Obrador is pursuing a "humanitarian" approach to the problem, vowing to stem the flow of people by finding jobs for the migrants. In exchange, he wants Trump to help spur economic development in the region.